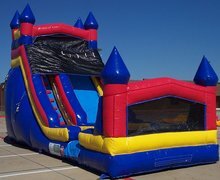 Dry Slide Rentals | APartySolution.com Cedar Hill TX. 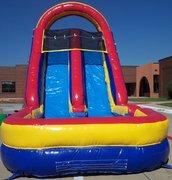 Dry slide rentals are a great choice for locations where water use is not appropriate. This makes them the "go-to" rental for school carnivals, church festivals, and company picnics. All of our inflatable slide rentals are cleaned and sanitized before every rental, and are manufactured from "lead-free" vinyl for your child's and your guest's safety. Browse the selections below and click on the image or "More Info" link to get additional information and to make a reservation. Double Lane Dry Slide- 18 ft.